Brent oil prices decreased by 2.68 % or US$2, as prices fell this week. Oil traded on May 3, 2018 at a price of $72.69 per barrel relative to US$74.69 last week. Brent oil began the year at US$68.07 per barrel. 87 Octane prices increased week over week, by 1.04% (JMD$1.32). Additionally 90 Octane rosel by 1.02% or (JMD$1.32) week over week. 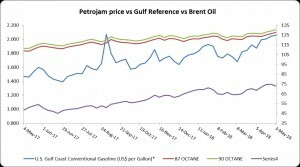 87 Octane and 90 Octane opened the year at J$121.04 and J$123.88 respectively and now trades at J$127.70 and J$130.54 per litre respectively. U.S. crude oil exports rose 527,000 barrels per day (b/d) from 2016 to average 1.1 million b/d in 2017. The increase in export growth occurred due to the inability of the U.S. Gulf Coast ports to fully load the Very Large Crude Carriers (VLCC) which are the most economical and largest vessels for transporting crude oil. Export growth was instead obtained from using smaller and less cost-effective ships. Although recent emphasis has been placed on pipeline constraints limiting the amount of crude oil coming into the U.S. Gulf Coast, potential shipping limitations are also relevant. The VLCC’s need large ports with enough depth and width of waterways for safe navigation and can move approximately 2 million barrels of crude oil. The U.S. ports within the Gulf Coast that actively trades petroleum are from inland harbours and is connected to the open ocean through shipping channels or navigable rivers. These channels and rivers are usually dredged to maintain depth and safe navigation but are not for deep draft vessels like the VLCCs. To avoid dept restrictions, VLCCs use partial loadings and ship-to-ship transfers in transporting crude oil to and from the U.S. Gulf Coast. This ship-to-ship process known as lightering is when a larger vessel unloads partially onto a smaller vessel whereas reverse lightering occurs when the smaller vessels load onto a larger vessel. These transfers are done in designated lightering points and zones outside of the biggest U.S. petroleum ports.